The Nokia Asha 500, 502 and 503 feature phones are three closely-related devices sharing a very similar design philosophy, and the follow on from the first "next generation" Asha, the 501. We've covered Asha devices many times before, and although they are not smartphones as such, you can still download applications to enhance those already installed on the handset, and Nokia have also added new apps to help with social networking and photography. The cheapest of the bunch is the Nokia Asha 500, priced at $69 before tax and subsidy. This has a 2.8" 240 x 320 pixel (QVGA) display and a 2 megapixel camera, plus a microSD slot and Bluetooth, supporting 2G data and WiFi, and it will be available in dual-SIM or single-SIM versions. The Nokia Asha 502 moves a little upmarket with a 3" QVGA display, a 5 megapixel camera with LED flash and is a dual-band GSM phone in dual-SIM configuration only plus WiFi, slated to cost $89 plus tax SIM-free. 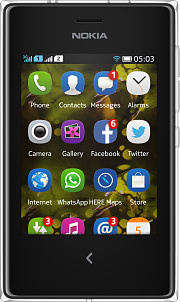 Coming in at $99, the Nokia Asha 503 adds 3.5G support and a Gorilla Glass display, and this also comes in dual-SIM and single-SIM versions. These Nokia Ashas come in a very wide range of bright colours, but look more closely and you will see that they have two layers. There's a tough transparent layer on the top with the coloured polycarbonate body underneath, which makes them rather distinctive and attractive. 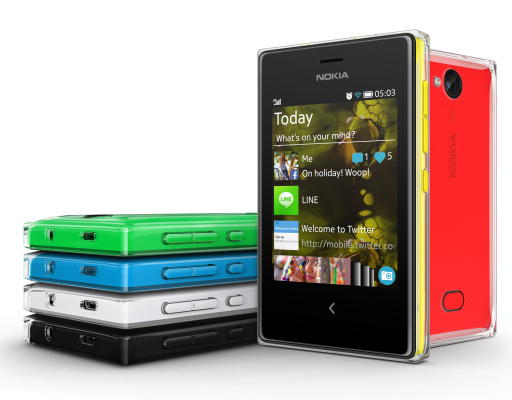 Slated to be available during Q4, the Nokia Asha 500, 502 and 503 will be available in Africa, Asia-Pacific, Europe, Latin America and the Middle East.